Overall health and vitality is important to many people, and this is a very good reason there are so many health and wellness products available on the market today. 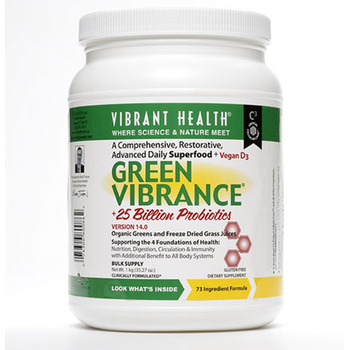 At Consumer's Survey, we frequently review various different kinds of these products, so when we came across Vibrant Health Green Vibrance, we knew we had to check this one out as well. Hundreds of customers before us have tried and reviewed this product already, so we also took the time to scan through these reviews so that we could get a more educated opinion on it. This product gives you trace nutrients which help all cells function at their peak efficiency. This can result in increased endurance and energy, plus greater clarity of though, an immunity that is more robust and an overall shift of all of your bodily functions towards the ideal point. Green Vibrance addresses some essential yet basic biological requirements to achieve this. These include the right amounts of a group of healthful nutrients, an efficient and healthy gastrointestinal tract and nutrients delivered to all the cells of your body, even those at the periphery of the capillaries' reach. With all of these things in place, you can achieve optimal health with sustained energy production, a strong immune system and systems which run cleanly and smoothly. Vibrant Health Green Vibrance focuses on concepts such as the modern diet fails to give you enough micronutrients for the best health, the biochemistry inside us has not changed in the last forty thousand years and the body can heal itself if it has the right nutritional support. Green Vibrance was made as a concentrated and nutrient-dense food from vegetable sources. It is meant to give you trace nutrients at much higher concentrations then found in modern diets, improve your circulation and cardiovascular health so it can deliver these nutrients to each cell of your body and support an efficient and vigorous immune system. Vibrant Health Green Vibrance gives you healthful, nutritional support to the eleven body systems. It will give you a more complete nutrition, support for healthy circulation, increased energy, support for gastrointestinal function and digestion, support for the clearance of waste produces of detoxification and metabolism, support for neurological health and cardiovascular function, support for immunity and normal blood sugar and cholesterol and a resistance to oxidative changes that are associated with aging. The best thing about this is that anyone can use it, even seniors and pregnant women. From our experience and many other reviewers, this product gives you fantastic energy and makes you feel overall healthy and fantastic. A great testimony is from one person who was an avid smoker for many years before starting to use this product. They never had any energy, no attention span, or any mental clarity. They never did well in school, either, but when they began taking Vibrant Health Green Vibrance all of this began to change. They had more energy than ever before, and they began reading everything and understanding it, giving them great grades in college. There have been some reviewers that had a problem with the taste, and it is also recommended that you check the ingredients thoroughly and with your doctor if you have any current health issues to make sure that there is nothing in this product that would interfere with current problems or medications.